Yes, technically furries are people who are INTO anthropomorphic animal characters, not the animal characters themselves, and it is the latter that Jackson is suggesting he turn Howard into. But ‘anthropomorphic animal character’ doesn’t exactly roll off the tongue. Besides, Jackson has at times shown himself to be kind of stupid, so failing to note a distinction like that is entirely in-character. 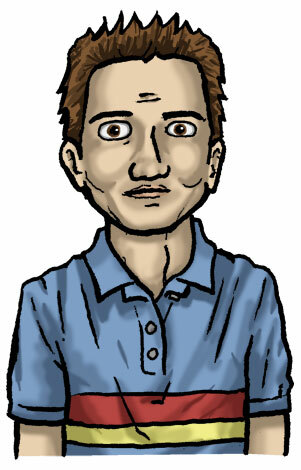 Perhaps you’ve read Tony Piro’s webcomic Calamities of Nature before. Its core cast of five “funny animals” provides an outside perspective on human nature, society, science, religion, philosophy, and bacon. I had a lot of fun emulating Tony’s subtly-colored, hatched artwork for this parody–say what you will about his humor, but you can really tell he goes the extra mile on his art. Strips featuring Aaron the mole do tend to be predictable, though. Generally speaking, Tony’s a clever cartoonist with his fair share of chops. But if you’re unfamiliar with Calamities and want to check it out, be forewarned that it contains provocative topics and occasional crude humor. And Aaron. Check it out, it’s a semi-realistic Independent Music James! I plan to make more of these for the Subscribers’ Edition over the next couple of weeks. The Subscribers’ Edition also gives you access to Joe Harris’ color Sketch Comedy strips, exclusive extra strips, and other bonus content. 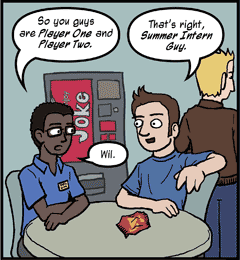 I did a guest strip for Another Videogame Webcomic! Another Videogame Webcomic has a unique premise behind it: the cast of AVW literally works in video games. It’s not 100% clear whether they’re actors and producers “filming” the video game, or whether they’re actually performing the actions that game players input through the controller, but somehow Player One and Player Two are the guys who bring Mario and Street Fighter to your screen. AVW is brought to you by the indomitable webcomic juggernaut team of Joe Dunn and Phil Chan, and it is awesome. Go read it now.